Thank you very much for your very interesting magazine. As a secretary at a Bais Yaakov High School, one of my responsibilities is to put together a “Student Planner’ – basically a homework assignment notebook dated through the school year that is given out to our approximately 220-250 students each year. The planner includes stories from books, newspapers, etc. This letter comes to request permission to copy an excerpt from your article “Keeping Kosher in a Hurricane” which appeared in the Kislev 5778 edition. The section referred to follows the heading “Convoy of Hope.” This particular account is such a beautiful demonstration of Mi K’amcha Yisroel. I hope we’ll be able to include it. Thank you. Thank you for such a beautiful issue of the Kosher Spirit Magazine! I was wondering if the vegan restaurant article starting on page 8, purposefully omitted mentioning kosher standards for wine and vinegar products, which typically have strict kosher rules and also may be found in a vegan restaurant. The omission was unintentional. You are correct that the many regulations regarding wine and wine vinegar also apply to vegan restaurants. Yet another reason why kosher certification is essential! 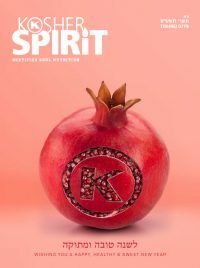 I recently read with much interest the latest edition of Kosher Spirit. I was puzzled though by something in the article about vegetable infestation. The author maintains that if the vegetables are pureed or blended (eliminating the בריה concern) then the food would be permitted on the basis of bottul b’shishim. This would seem to imply that the food is only permitted if its volume is 60 times that of the insect. However, Shulchan Oruch Y”D 104:3 clearly states that insects are botul b’rov since they are nosein taam lifgam. It would seem that a simple majority of food vs. insect would be sufficient once there is no longer any בריה issue. I understand this is of little practical significance as there is always 60 times more food than insect. I am just wondering about the halachic accuracy of the author’s words. Thanks for your wonderful publication and the wonderful work you do in the kashrus field. Thank you for your letter. Ba’er Hetev (Se’if Katan 8) comments on the halacha you quoted from Yoreh Deah 104:3. He points out that that tolaim are different to zevuvim and tolaim do need shishim to be botul. The Shach at the end of Yoreh Deah 107 (Se’if Katan 7) further points out that even by zevuvim many Poskim are of the opinion that it is not botul brov and requires shishim like any other issue. Also see 84:9 where the Rema writes that tolaim require shishim, as well as Shach’s response on the Rema 84 (Se’if Katan 30). My utmost respect for you is what prompts me to write this email. I took a break from my busy Erev Yom Tov schedule to have a coffee while casually perusing the latest edition of Kosher Spirit magazine. I usually find your magazine filled with interesting and uplifting articles appropriate for each Jewish season. However, this time I was greatly disappointed by the article titled “Making Pesach Fun Again”. Let me explain: 1. The title itself is lacking in true Jewish sensitivity, a Talmid Chochom of your stature is surely familiar with the Teshuva of Rabbi Moshe Feinstein deriding the term “fun” as a goal in Yiddishkeit. Perhaps a more appropriate title would have been “Making Pesach Inspiring Again”. 2. “Imbuing Peasch with a sense of fun and whimsy is just as important if not more important than elaborate menus and shopping lists” Huh? Whimsical themes are for Disney, et al. I’ve never heard of whimsy playing a role in Pesach. 3. Tablescapes: “There is also a Minhag to put silver items on the table” How sad when the minhag mentioned in Shulchan Oruch plays second fiddle to table themes found on Google. 4. Dress Up: Please let your author know that there is also a minhag for the Seder leader to wear a Kittel (perhaps under his holiday themed whimsical costume) 5. Games and activities: “various games and activities throughout the evening. There are so many options for Seder games, you can search for ideas” Chazal gave us scores of different mitzvos to do Leil Seder, lets focus on fulfilling these mitzvos with passion and feeling, there will be no need to search out there for empty games. 6. “Keep Torah discussions to sound bites” this is absolutely appalling G-d forbid there should be too much Torah at your Theme Parked Great Seder Adventure, your children might actually realize that we are the Am Hanivchar and have absolutely no need to copy the Goyim for our Yomim Tovim! “Perhaps a theme can be about healing this year. How can we heal – physical health – emotional health-heal our relationship – heal our communities, and if you want to get political how can we heal our country?” Congratulations! You have now succeeded in removing any vestige of Yiddishkeit in your Seder. Perhaps the themes mentioned in Chazal such as Avdus Licheiros, Emunah and Bitachon, Kol Yochol. Mechadesh Bituvo Bechol Yom, Hakaros Hatov, Kabbalos Hatorah, would be more appropriate. Our entire heritage must and can be transmitted to the next generation at the Seder with love, passion and Kedusha! Lastly “Connect with Duby… or stalking her on Facebook” I don’t believe frum publications should joke about stalking woman, we must never forget that we have a higher moral code than what is regularly found online. Please issue a recall immediately, this is an embarrassment to your wonderful organization and besmirches the reputations of all the great Talmidei Chachomim associated with the OK . Thank you so much for taking the time to share your opinion with us. Ideally, all Jews would be able to take their inspiration solely from the Haggadah, but unfortunately, in today’s world, many are far from Yiddishkeit and props and thematics help bring them in to the Seder at their level. In addition, there are many of our children who need this type of chinuch as well. We look forward to a Pesach when all will be at the level of full inspiration and these props and ideas will no longer be relevant.